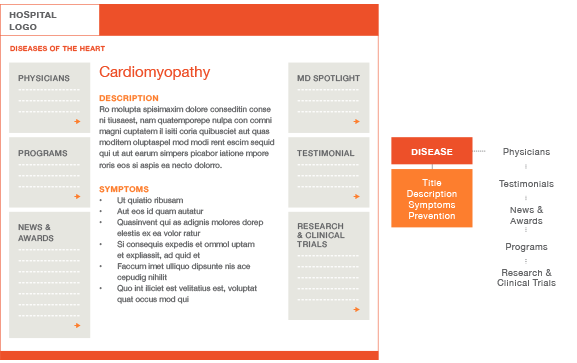 Hospital website redesigns aren’t easy. First of all, there’s the internal politics. They seem to put the needs of individuals and department agendas over the needs of the entire organization. This complication seems to affect hospital website redesigns more than any other industry. Make sure your new website supports your readers’ goals and your organization’s business objectives. The best way is to conduct small batches of primary research in the upfront portion of your project to create audience personas and journey maps. Just be sure you're looking beyond standard demographics (which are important too) and considering what motivates different patient audiences on a personal level. To learn more, check our recent article in eHealthcare Strategy & Trends. With some great research insights in place, you can then shape your digital marketing strategy. Websites. Mobile apps. Search marketing. Online ads. Content marketing. There’s no end to the digital marketing tactics you could choose. Your roadmap, however, should align with the digital media your target audiences use most. For example, it makes no sense to spend time putting together a social media strategy if your audiences don’t use the social media space (Hint: they do). Download our eBook to explore four models to architect, design and build a consumer-centric hospital website that also delivers measurable ROI for your C-suite. Step 2: Put down the wireframes and photoshop. Start with your brand. Your brand is your most powerful differentiator. Lead with the heritage, the innovation, the culture and your people. These are unique. Taking the time upfront to define your hospital’s story will make a world of difference in a site that feels unique to you. See how Overlake Medical Center, Nantucket Hospital and Cooley Dickinson Hospital did just that.